Central to [Keen's] ideas is the concept that demand for credit creates loans which create reserves, which is the opposite causality of what one sees in neoclassical economics. First, it makes it less likely than most people think that the giant banks will increase the amount of money they're loaning out to individuals and small businesses. Specifically, since loans are made before new infusions of government cash (Kydland and Prescott), there is not a simple cause-and-effect relationship. So the bailouts to the banks will not necessarily encourage them to make more loans. Indeed, the heads of the big banks have themselves said that they won't really increase such loans until the economy fundamentally stabilizes (no matter how much money the government gives them). A funny thing happened to the inflation theory: Banks aren't lending and proof can be found in excess reserves at member banks. In practice, banks lend money and reserves come later. When defaults pile up, the Fed prints reserves to cover bank losses. 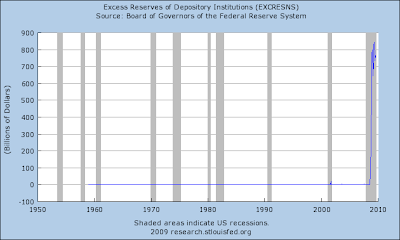 Thus, those "excess reserves" aren't going anywhere. They are needed to cover losses. It's best to think of those reserves as a mirage. They don't really exist. Second, if banks won't increase their lending in response to government funds, then that argues against inflation and for continuing stagnation in the economy. Is This Method of Credit-Creation Unsustainable? Going beyond what most economists believe or will publicly discuss (and going beyond what I have any background or inside information to confirm) - monetary reformers like Ellen Brown argue that the entire banking system is based upon a fraud. Specifically, she and other monetary reformers argue that the banks have intentionally spread the false reserves-and-credit first, loans-and-debt later story to confuse people into thinking that the banks are better capitalized than they really are and that the Federal Reserve is keeping better oversight than it really is. "System design affects user behaviour but user behaviour does not affect system design unless it acts to alter of replace it." So, banks work like casino banks issuing new chips, not like piggy banks lending out old ones. It´s good to see the money as debt meme getting the attention it deserves. Bank lending has decreased along with the velocity of circulation of money, as conceptualized. Why should the banks lend if they expect the economy to sputter along or descend back into the maelstorm? It would be irrational for them to risk making loans that they expect to go bad because of low consumption due to rising unemployment, credit defaults, and a general, newly-found thrift on the part of consumers. So if the banks are not lending then where has all that money gone? Ah, that´s right; our wonderful stock market rally. And why, pray tell, did Greenspan say that he expected the market rally to lead to an improved economy? How does neo-classical economics explain that little tidbit? "Unfortunately a serious fall in the marginal efficiency of capital also tends to affect adversely the propensity to consume. For it involves a severe decline in the market value of Stock Exchange equities. Now, on the class who take an active interest in their Stock Exchange investments, especially if they are employing, borrowed funds, this naturally exerts a very depressing influence. These people are, perhaps, even more influenced in their readiness to spend by rises and falls in the value of their investments than by the state of their income. With a “stock-minded” public, as in the United States to-day, a rising stock-market may be an almost essential condition of a satisfactory propensity to consume; and this circumstance, generally overlooked until lately, obviously serves to aggravate still further the depressing effect of a decline in the marginal efficiency of capital. When once the recovery has been started, the manner in which it feeds on itself and cumulates is obvious. But during the downward phase, when both fixed capital and stocks of materials are for the time being redundant and working-capital is being reduced, the schedule of the marginal efficiency of capital may fall so low that it can scarcely be corrected, so as to secure a satisfactory rate of new investment, by any practicable reduction in the rate of interest. Thus with markets organised and influenced as they are at present, the market estimation of the marginal efficiency of capital may suffer such enormously wide fluctuations that it cannot be sufficiently offset by corresponding fluctuations in the rate of interest. Moreover, the corresponding movements in the stock-market may, as we have seen above, depress the propensity to consume just when it is most needed. In conditions of laissez-faire the avoidance of wide fluctuations in employment may, therefore, prove impossible without a far-reaching change in the psychology of investment markets such as there is no reason to expect. I conclude that the duty of ordering the current volume of investment cannot safely be left in private hands." Now, were one to be of the conspiratorial minded sort, one would have to start giving credence to the plunge protection team theory and with tin foil hat on start to disabuse oneself of the illusion that such a thing as a free and fair market exists. But what do I know. I am not an economist. This both hits and misses the point. Yes reserves follow credit, but credit does follow reserves too, as we all know. The point missed is that the relationship is not linear but cyclic. I mean, goddamn, of course its cyclic, this is money we're talking about!